Your chance to see the City of Brotherly Love on a scenic helicopter tour! Your chance to see the City of Brotherly Love on a scenic helicopter tour! See Philadelphia from above! Philadelphia is a city steeped in history and renowned for its iconic imagery made famous in many Hollywood movies. Darting across the city on public transportation is one way of taking it all on, but it's definitely not the best way! Philadelphia deserves to be explored by all angles. Its shimmering skyline only truly reveals itself to the passenger in a helicopter. Departing from northeast Philadelphia, you'll spot the beautiful Philadelphia skyline immediately. Imagine flying high above Penn’s Landing, the Philadelphia Art Museum, Boat House Row, and Battleship New Jersey. This scenic flight of Philadelphia covers all these sites and more! For 30 minutes you’ll be in a comfortable Robinson R44 – perfect for up to three passengers and allowing a window seat for every passenger. The cockpit’s dome offers unrivaled views of the urban concrete jungle of the Philadelphia skyline. 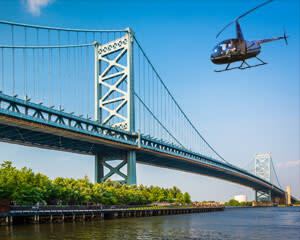 Book a 30-minute helicopter tour of Philadelphia today! Had an amazing experience and surprised my guest for their birthday. Overall great memories for both. Our pilots were the best. I really loved our pilot. He made my fiancée and I so comfortable. We was so nervous at first. Shout out to him. Very nice guy. Amazing experience! Our pilot was extremely friendly and knowledgeable. He did a great job and made sure we enjoyed the experience.